Northern Hardwood Company provides a vast number of wood gym flooring systems to meet each customer's specific demands. If you are building a new facility or retrofitting an existing one, we have a wood gym flooring system that will meet your specific needs. Our experienced staff can help you customize the gym floor of your choice. By incorporating different grades of maple or by combining different subfloor systems, we can enhance safety and performance in the on-court areas, while economizing in the off-court areas to reduce the overall expense of the wood gym flooring entire project. As an accredited MFMA (Maple Flooring Manufacturer’s Association) member, Northern Hardwood Company represents Connor Sports Flooring in Washington, Oregon, Idaho and Montana. 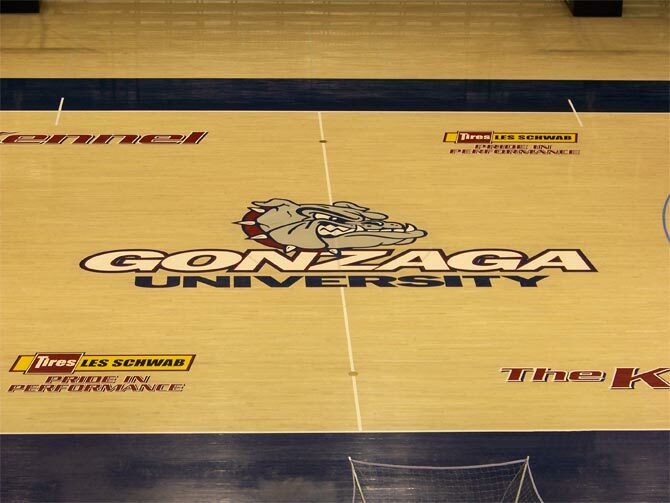 Connor Sports Flooring is the #1 Wood Athletic Flooring manufacturer in the country and provides all the NCAA Men’s and Women’s Final Four floors. Combining features of both floating and fixed systems, fixed resilient systems provide the stabilizing benefits of anchored subfloors and the resiliency of floating systems. Northern Hardwood Company offers a wide array of fixed resilient floors to fit with your particular activities, level of play, budget and facility size. For more information please visit the Connor Sports Flooring website. Northern Hardwood Company offers fixed systems that are mechanically fastened to the concrete substrate, providing a stable subfloor system. As a result, these systems offer outstanding buckle resistance, but provide minimal resilience. For more information please visit the Connor Sports Flooring website. Northern Hardwood Company offers floating systems that rest freely without anchorage to a concrete substrate. Through subfloor components and various elastomeric pads, these system’s key benefits is shock absorption and resiliency, however, they do not provide the stability of fixed resilient systems. For more information please visit the Connor Sports Flooring website. Northern Hardwood Company offers an economical hardwood floor called SportBond Parquet which comes in multiple design options and performance levels. For more information please visit the Connor Sports Flooring website. Northern Hardwood Company offers portable floor systems: modular floors that align easily for quick assembly. They’re perfect for multi-use facilities and arenas that house everything from hoops to hockey. For more information please visit the Connor Sports Flooring website. Protect your performance wood floor from damage during non-sporting events with a floor covering system from Northern Hardwood Company. For more information please visit the Connor Sports Flooring website.